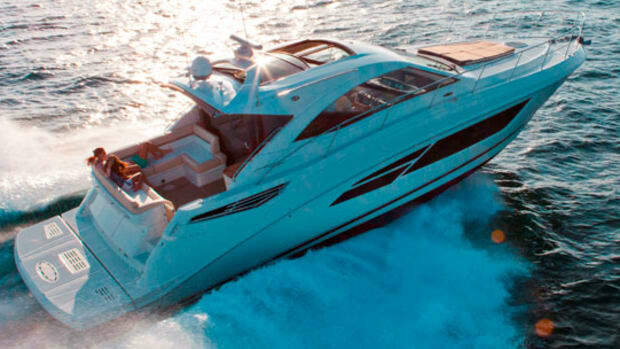 So when the second-largest-ever boat in the line, the 60 Sundancer, premiered earlier this year at the Miami International Boat Show, I expected a near riot on the quays. Fortunately there was plenty of room for a dozen at a time to tour a vessel that&apos;s the essence of a successful three-decade run. Take the 41/2-foot-wide standard hydraulic swim platform, well-suited for a PWC or RIB. 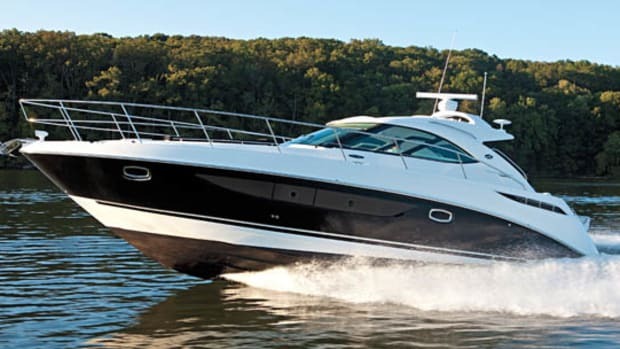 "We made [it] standard because it was an option on last year&apos;s larger models that most buyers chose," says Gary McCloud, Sea Ray&apos;s product manager, who joined me for my test. 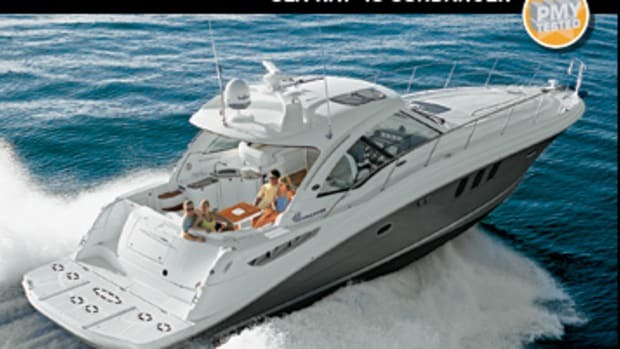 He added that it&apos;s common practice for Sea Ray to make popular options standard the next model year, a policy that rang true when I entered the gracefully curved, two-piece sliding door that leads to the "upper sunroom" and saw she was dressed to kill with an array of standard features. The sunroom, by the way, is one heck of a design innovation. While her exterior lines didn&apos;t blow me away—they&apos;re too heavily borrowed from smaller Sundancers and not a singular, unique look for the line&apos;s flagship—the sunroom shined. 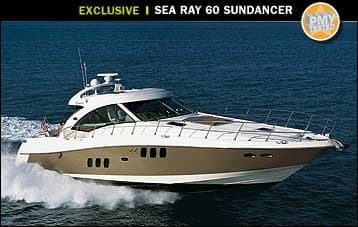 Instead of the express-style setup that appears on all other Sundancer models, the 60&apos;s is fully enclosed. The area is bathed in light from two forward-facing and two side windows and is equipped with a pair of electrically actuated, side-by-side glass roofs. With the roofs and glass-and-steel sliding doors open—they&apos;re center-opening doors, sliding into pockets to port and starboard—the sunroom enjoys excellent cross ventilation. I also liked the sunroom&apos;s furnishings, which appear to be influenced by modern Danish design. Supple, cream-colored Ultraleather with walnut accents grace the starboard settee and a pair of chairs to port. Both blend well with the teak sole and walnut cabinetry, also standard. And the settee&apos;s an ideal vantage point to enjoy that standard equipment package: Had I more time, I could&apos;ve gotten real comfortable watching DVDs—in Surround Sound, of course, courtesy of the Bose 3-2-1 system—on the 27-inch LCD TV that rises from between the chairs. 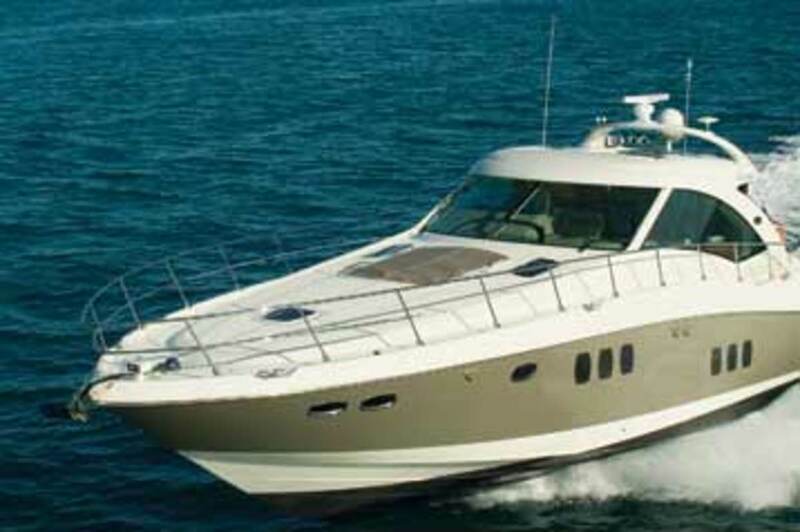 Our test boat also boasted a DSS Satellite TV system and a 20-bottle Franklin Chef wine cooler, making her a real entertainer. With the standard 40,000-Btu air conditioning cooling the sunroom, it was hard to pry myself from the settee. But I did, to explore the remainder of the interior, and the 60 continued to flaunt her style below decks. I applaud the designers&apos; decision on the centerline companionway: Instead of molded-in stairs, the 60 has a set of six teak steps mounted on a steel beam, giving them the appearance of floating in the air. It&apos;s a nice architectural accent, and with the sturdy grabrail the stairs are safe to climb as well. 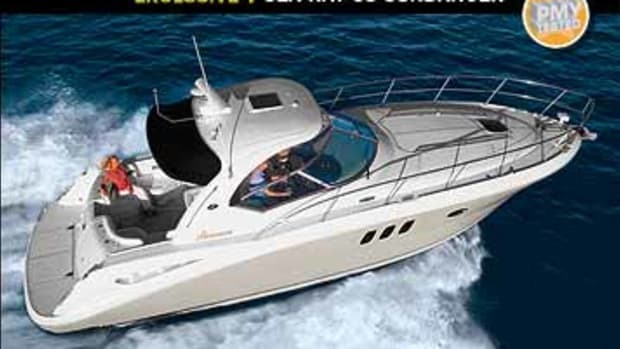 As for the floor plan here, the interplay of the port saloon and galley should make for great entertaining. 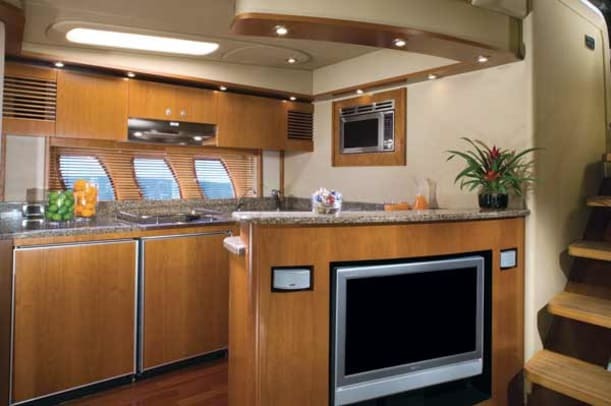 The galley&apos;s directly across from a C-shape settee with 32-inch LCD TV and Bose 3-2-1 system (both once options, now standard) built into the back of the cabinet that defines the galley area. Guests can lounge in the saloon while the chef preps dinner—and with a standard three-burner cooktop, a microwave/convection oven, and plenty of counter and stowage space, this should be a breeze. Or you can stand with a cocktail in hand at the 48-inch-high countertop that separates the areas and chat up the cook. And both areas feel roomy, taking advantage of the 16&apos;9" beam and 7&apos;2" headroom. 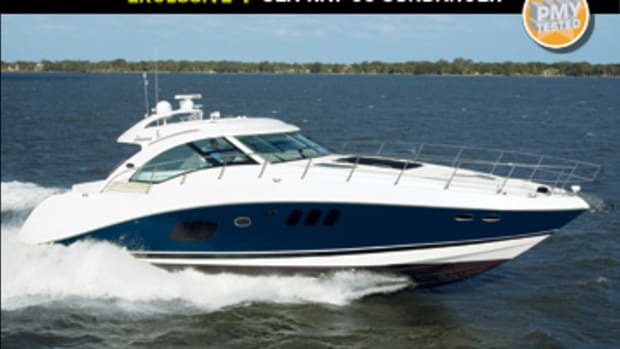 I heard the mains kick on, so I headed up those slick floating steps to the upper sunroom&apos;s starboard-side helm for our sea trial. Again, I was greeted with both comfort—a Stidd helm seat and matching companion double chair—and more standards, specifically electronics. 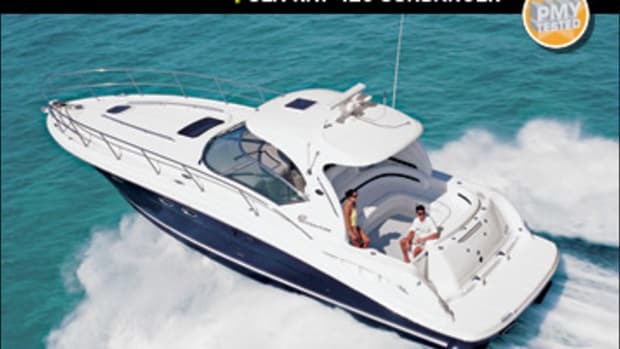 As we idled toward the Indian River, I noticed the pair of 12.1-inch color monitors—one a touch-screen Sea Ray Navigator, the other a Raymarine E120 chartplotter/4-kW radar. 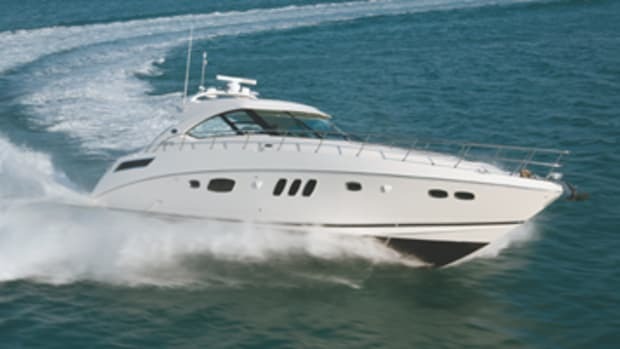 A Raymarine 240 VHF and ST800I autopilot as well as the boat-shaped control for the Side-Power bow and stern thrusters flanked the screens. Once in the river, I recorded a top speed of 41.5 mph and a cruise speed of 35.2 mph at 2000 rpm. Sound levels were impressive: My dB meter hovered in the mid-to-high 70s throughout the entire rpm range, peaking at 82 dB-A at WOT (65 dB-A is the level of normal conversation). Credit&apos;s partly due to the sound-attenuation panels made of fire-resistant, aluminum-face melamine foam on the engine-room overhead, which I&apos;d seen on my earlier inspection of the ER. After switching positions with the captain, I noted the MAN engine-monitoring displays above my head and firewalled the single-lever MAN electronic controls. The river was countertop-flat, so I unfortunately can&apos;t comment on her rough-water capability, but as the standard 1,100-hp MANs spooled up, I observed unobstructed sightlines in three directions; unfortunately you&apos;ll need a mate or an aft-mounted camera to back her into a slip, as the swim platform is invisible from the helm. 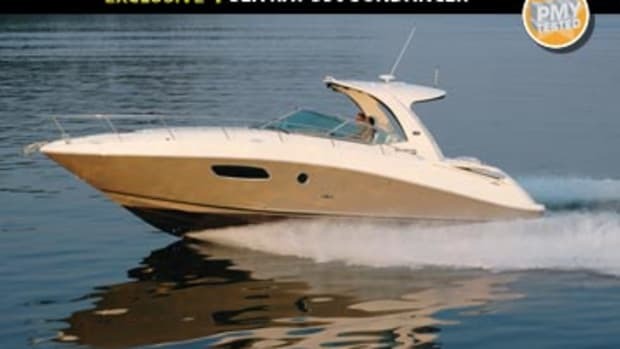 She banked smoothly into turns with little loss in rpm, but took nearly a dozen boat lengths to come around during full-speed, 180-degree turns. Bowrise was a little high in the midrange, peaking at 5.75 degrees but settled in at four degrees at higher speeds. 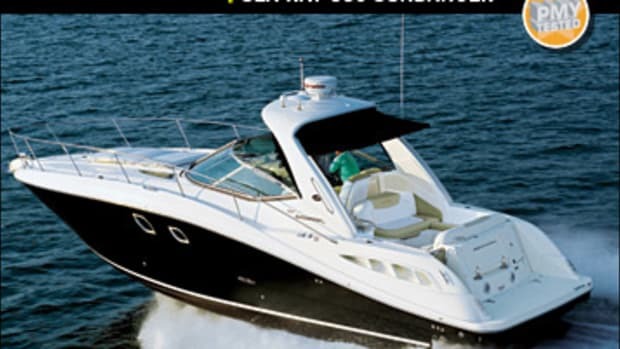 Later, I ceded control of the 60 back to the captain, and as we idled down Sykes Creek on our way back to Sea Ray&apos;s facility, I relaxed on the upper sunroom&apos;s settee. I may have looked as if I was contemplating something substantial about her wring out. I admit now I was just enjoying the moment, enveloped in the creature comforts of the excellent upper sunroom.